You’re too young, you’re too old, it’s too high, you won’t like it, that’s dangerous, don’t get dirty, there are germs!!!! Have you heard these all too common sayings that I admit to have said on occasions when my ‘risk radar’ was too high. Do you remember when you were young and you would climb a tree and not a single person would blink twice, explored the shed for hidden treasures, walked to your friends house knowing as long as you were home for dinner, your parents trusted that you were safe. There may be different scenarios for you but truth be told, our society has really upped its risk analysis. This was certainly my experience lately from sharing the news that Functional Skills Focus is starting a therapeutic Sewing program for youth with Autism Spectrum. Although some of the comments seemed quite innocent, I will let you be the judge whether any hidden assumptions were present. To me what these comments have in common is the concern of sewing being a risky business. There are scissors, needles, pins, machinery which all do have a level of risk. However, like with anything if you are taught to use a tool properly you are minimising the safety risk to the best you can. Most accidents occur because a safety breach occured or the operator was not well informed on how to use it. That just reminds me of the many burns I have had with a hot glue gun and a steaming hot iron! I do believe that our ‘risk radar’ is an essential part of our human behaviour but at times it seems easier to choose the safety route of why instead of why not? When I was younger, learning how to sew gave me so much confidence whilst giving me something to believe in. It especially helped me to identify my strenghths and being non-competitive was a bonus as I wasn’t in anyone’s shadow (sometimes this can be a good motivator but can also be detrimental when you struggle with your own self-belief). This wouldn’t have happened without taking the risk and having a supportive family to encourage me. A bit contradictory but in the spirit of safety and minimising risk, I am very excited with my next purchase on order from All Make Sewing Centre. 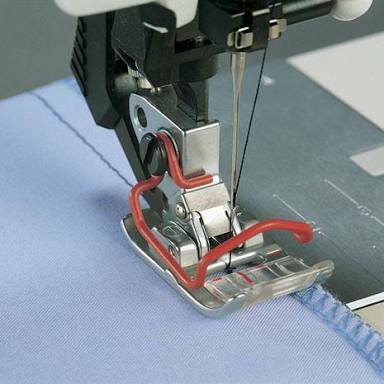 The picture is from the Pfaff website of a finger guard to go on each machine to protect the finger from being spiked when the machine is in motion. Pretty nifty and with less risk involved, it is certainly more enticing to start your sewing journey soon. Only 3 more weeks to the program starts with the count down on. Check out group programs for more information. I can’t wait!!! !